The monthly fixed fee will be 1.5 euros for most apartments and 3–5 euros for detached houses depending on the main fuse. The limit for the annual consumption volume is somewhat conditional, but it is the electricity consumption volume typical to places of consumption not permanently lived in. In such places, the client's contribution to maintaining a network connection has been zero or very small until now and this influences the network fee paid by other customers. The main purpose of the changes is to secure the lowest possible price for network services in the long term. For this we need a network that meets the actual needs of customers. In other words, we should not be maintaining excess network capacity. Our network currently covers about 57,000 consumption points that do not use or use very little electricity, but want to keep the network ready to supply. There are also over-dimensioned network capacities – main fuses with unnecessarily high ratings that affect the costs of the network company and therefore also the service price when the network is being upgraded. The changes will give us a better estimate of the network locations and capacities that our customers need and this helps us keep the service price as low as possible. The network service essentially ensures the readiness to supply electricity, and the costs of the network service do not particularly depend on whether electricity is used or how much. Our network currently covers about 57,000 consumption points that do not use or use very little electricity, but want to keep the network ready to supply. This corresponds to nearly 10% of all consumption points, and the costs of such readiness are reflected in the price paid by other customers of the network service. We have over 1,100 km of lines and over 300 substations that annually have not transmitted a single kWh of electricity, but about 16 million euros should be invested in upgrading them in the near future. A readiness fee will motivate customers to think whether they need a network connection and, if they do, to contribute to keeping it ready. The network operator can target its decisions better – we will upgrade the network in places where this is really needed, and will not spend the money received from payers of network fees unreasonably. 57,000 consumption points, over 300 substations and over 1,100 km of lines that have transmitted almost no electricity during a year. Due to price changes at Elering, the price list for Elektrilevi network services changed on 1 November. The average price of the network service decreased by 2.3%. 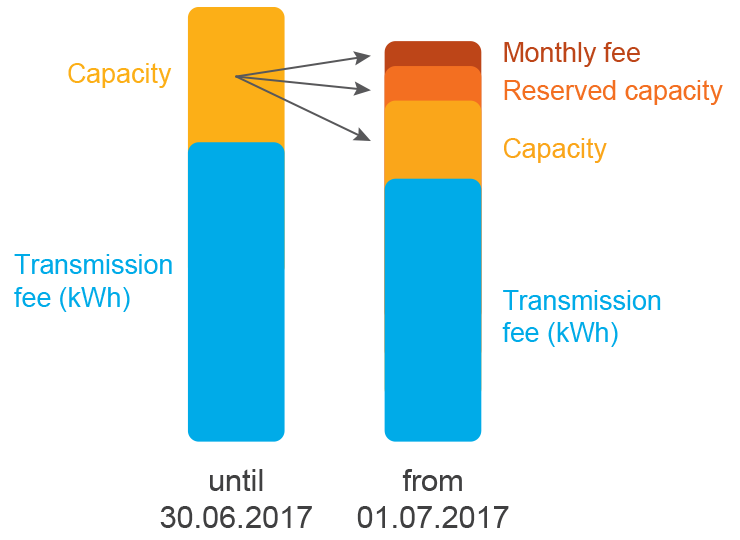 The price decrease mainly concerns the kWh rates for transmission fees, fees for medium voltage power usage, and reactive energy fees. 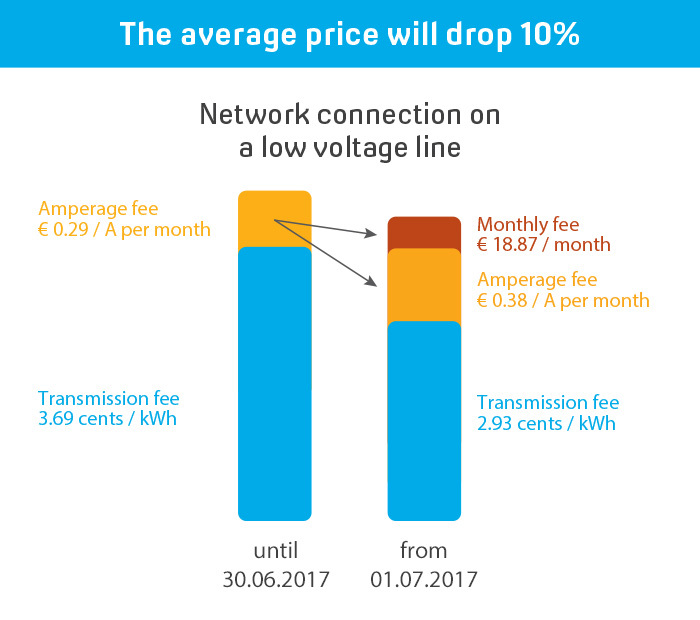 The change does not concern the monthly fees and network connection capacity fees (kW or A fees) established on 1 July or fees for low voltage power usage (in the VMA1 and VMA2 packages). The conditions and principles for the application of the fees have not changed. Customers can still check which package is the most suitable for them with the help of the package calculator. 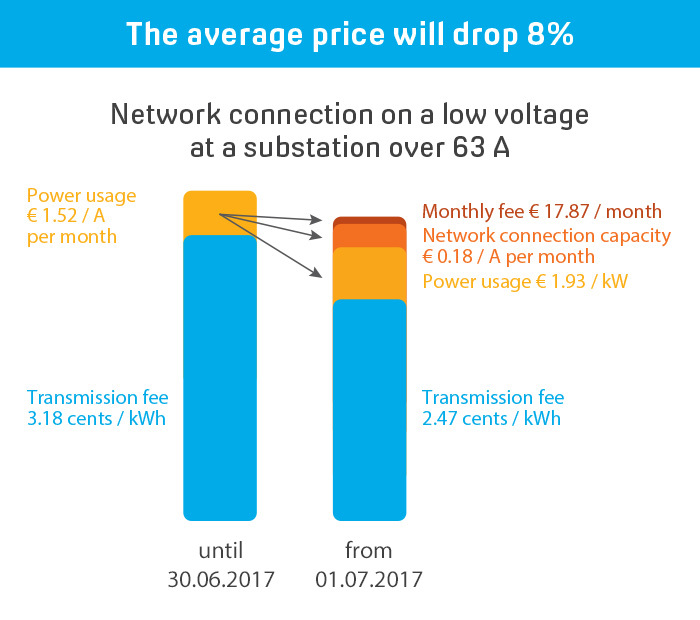 The prices of Elektrilevi's network services have changed from 1 July 2017. The average price of network services decreased due to Elektrilevi's increased efficiency. There are also a number of changes in the pricing model. Customers can check which package is the most suitable for them with the help of the package calculator. What changed for residential customers? The kWh price of the network service remains the sam for Network 1 (Võrk 1) and Network 2 (Võrk 2) packages, which do not include a monthly fee. A new network package is added: Network 2 with a monthly fee (Võrk 2 kuutasuga). While packages with a monthly fee have until 30 June been designed for customers with larger consumption volumes, the new package valid from 1 July is the optimum choice and reduces the price for many customers whose consumption volume is average. The Figure shows the approximate consumption volumes for which the new package is suitable. The consumption volume presented in the Figure is approximate, presuming that day and night consumption are equal. 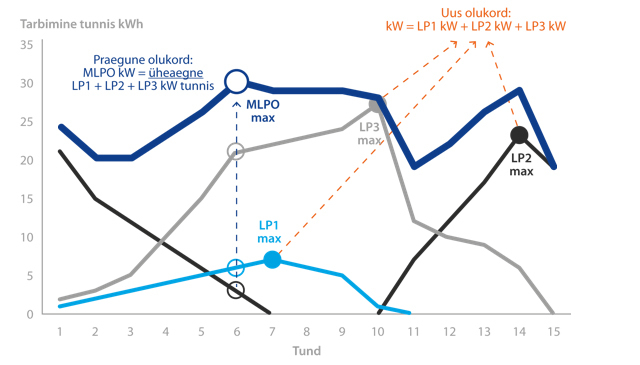 Network 3 (Võrk 3) or Network 4 (Võrk 4), if the annual consumption is over 9,600 kW. 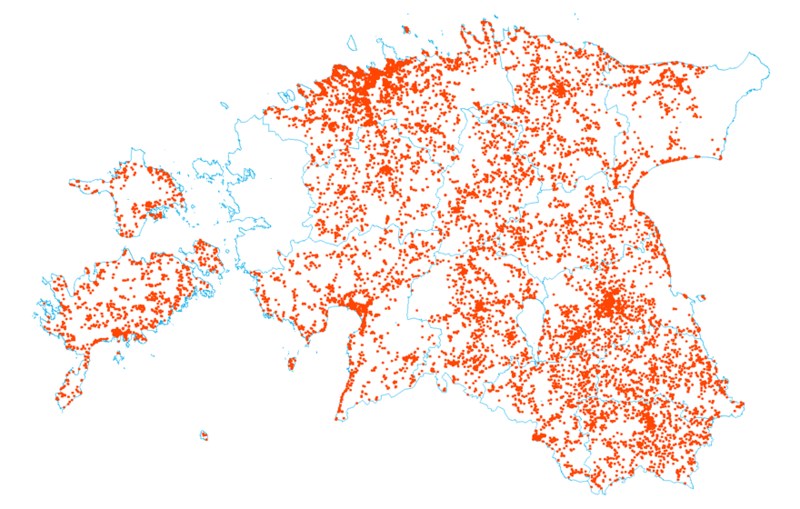 Network 3 (Võrk 3) or Network 4 (Võrk 4), if the annual consumption is over 2,900 kWh. Our e-service has a network package calculator that compares the price packages, and helps customers choose the most suitable package. Customers can then change their package conveniently online. 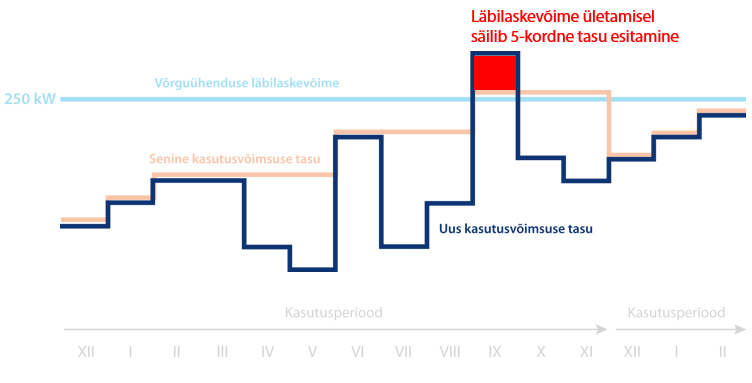 The network fee decreased, as a rule, in Network 3 (Võrk 3) and Network 4 (Võrk 4) packages, which include a monthly fee. 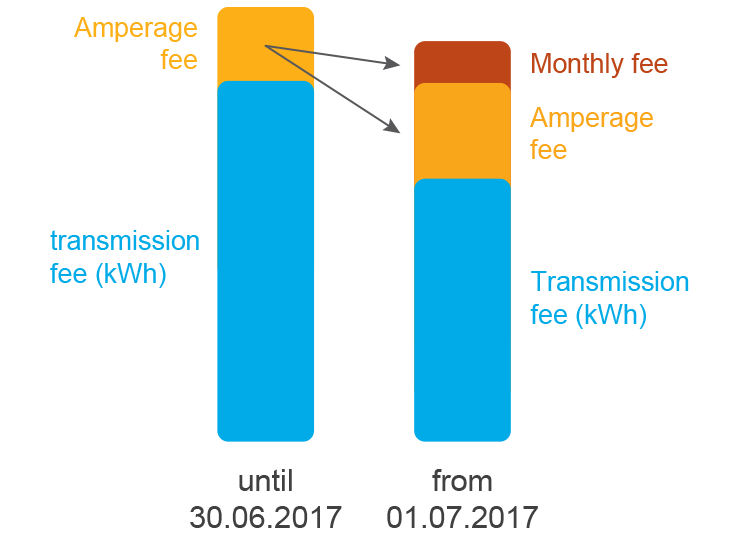 The fee components also changed: the current monthly and amperage fees (applicable until 30 June) have been replaced by a single monthly fee depending on the main fuse in detached houses and remain the same for most apartments. For network connections of up to 63 A, the main fuse rating can be reduced free of charge until the end of March 2018. The appropriate main fuse rating can be chosen using the main fuse calculator. The average price dropped about 8%. The network fee will be reduced for most energy-intensive businesses. While the average price reduction for the main business tariff groups is about 8–9%, one exception concerns those customers whose connection is under a 110 kV substation on medium voltage. The average price increased a little for them from 1 July. For this group of customers, the network service fee (until 30 June) has been low and sometimes even below the purchase price of the main network service. With the changes in the pricing model, the network fee for companies that use their network connections efficiently decreased. Companies that need the network mostly for readiness purposes or use it little or seasonally pay a little more than before. The prices of network services applicable from 1 July can be found here. You are welcome to consult your customer manager if you have any questions. Until 30 June, a company pays for network services, a transmission fee, a reactive energy fee and, as a fixed component, an amperage fee or fee for power usage depending on the capacity the company is using. From 1 July, the fixed price component depends on the number of network connections and the contractual reserved network capacity for the customer. Monthly fee – a fixed fee for each supply point. Network connection capacity fee for medium voltage – for network connections with a capacity over 630 kW, the fee is calculated for a capacity exceeding 630 KW. 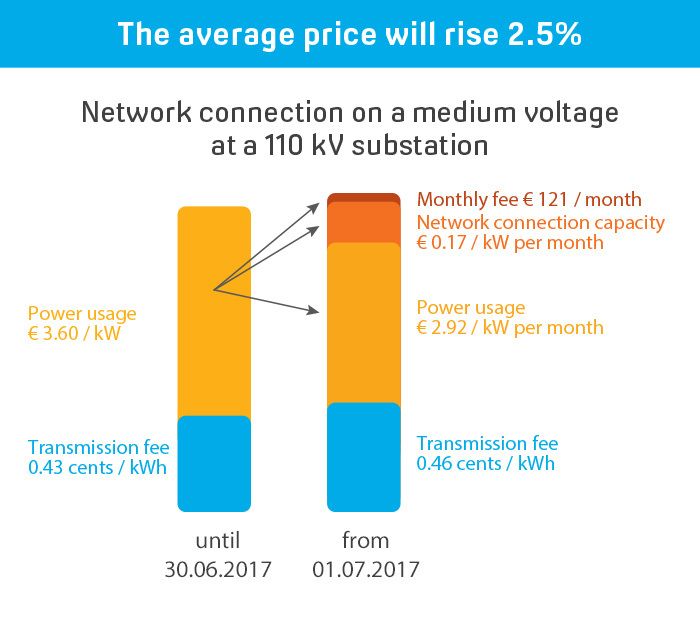 Network connection capacity fee for low voltage – calculated on the basis of the agreed capacity (amperage). 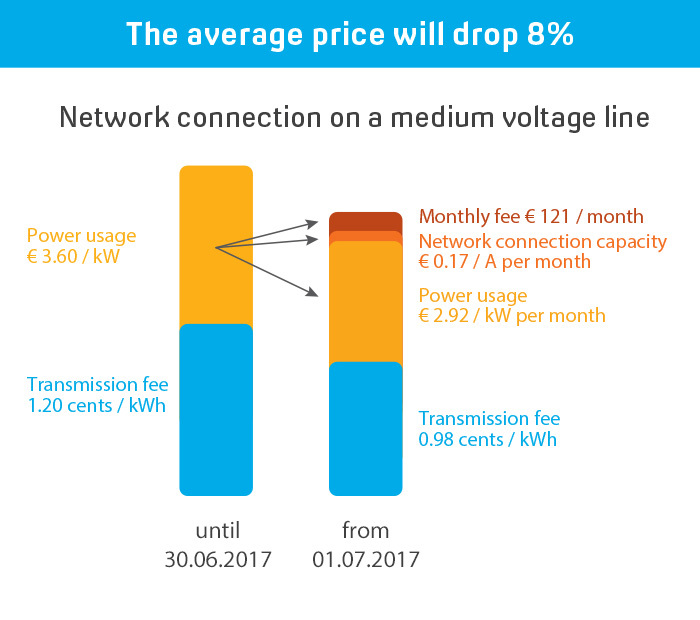 Fee for the power usage of the network connection – calculated on the basis of the maximum power used measured at the supply point in a calendar month. The power usage is the average hourly active power. An electricity producer pays a monthly fee (fixed amount regardless of the network connection capacity) and a network connection capacity fee. Monthly fee – the network fee according to the price list, regardless of the agreed network connection capacity. If the connection capacity for production differs from the connection capacity for consumption as agreed in the network contract, the fee is calculated on whichever is higher. At a place of consumption on a low voltage over 63A, the producer pays a network connection capacity fee that depends on the agreed main fuse rating. On a medium voltage, the network connection capacity fee is applied if the capacity exceeds 630 kW; the fee is charged for the part of the capacity exceeding 630 kW. A producer pays a fee for power usage if power is consumed from the network connection for over 120 hours during a calendar month. The fee is calculated on the basis of the power usage measured during the accounting month (measured maximum hourly consumption). for reactive energy supplied to the network if the ratio between the amounts of reactive and active energy supplied is over 0.15. If the ratio is 0.15 or lower, the network operator does not charge a fee for the reactive energy supplied to the network. According to the principle applicable until 30 June, the fee is charged on the basis of the maximum hourly consumption during the period of use. Under the new pricing model, applicable from 1 July, the fee is charged on the basis of the maximum hourly consumption during the calendar month. The agreement on the network connection capacity covering the supply point will remain applicable.